In a sea of blogs about Paris, Kate from MoreNativeThanTheNatives, a Parisian resident, is here to give you an insider’s guide to Paris off the beaten path and Paris on a budget. She’s crafted a plan for 24 hours in Paris with alternative things to do in Paris and some best kept secrets. Keep reading for this off the beaten path Paris on a budget guide with a map! Kate is a Brit turned Parisian who’s spent the last four years living in Paris. She chronicles her adventures around the world on her blog MoreNativeThantheNatives.​ She’s here to show you the off the beaten path side to Paris that most tourists don’t see with insider tips for some alternative things to do in Paris with a 24 hour itinerary for Paris. 24 hours in Paris: Your Alternative Guide to Paris. Paris is a wonderful city to visit. Known worldwide for the stunning fashion, spectacular architecture and delicious food, Paris isn’t cheap. I spent four years studying and working in this magical city, and the most important thing I learned in France (apart from how to speak French!) was how to have fun in Paris on a budget. ​ This is a guide not about the same things, but different things to do in Paris with some best kept secrets of Paris. Everyone has heard of the Louvre, Musee d’Orsay, and the Centre Pompidou. 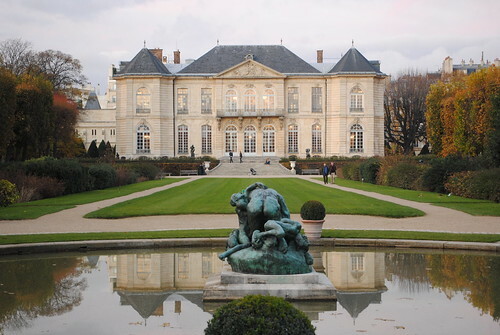 However, to avoid the crowds and the over-priced entrance prices, I implore you to visit the Musee Rodin in the 7th arrondissement. In my first year in Paris, I walked past this museum every day without knowing what it was, but my interest was piqued when I saw them constructing the haute-couture tent that was to house the Dior Couture show for Paris Fashion Week! I researched the actual museum itself after finding out this piece of fashion gossip and decided that I’d take a look around and I was far from disappointed. The gardens and house of the sculptor Auguste Rodin house countless pieces of his art and the paintings that he collected. It is the perfect culture stop in a city renowned for its artistic history. Karen’s note: Paris is best seen on foot, so consider walking in between places, which will make Paris on a budget just a bit easier. Similarly, you’ll also pass the famous Jardin des Tuileries, the Seine, Palais Royales on foot prior to discovering the beautiful galleries of Paris, one of the alternative things to do in Paris (where you’ll actually find some Parisians). The most important thing in my life is food. Despite what people think, you can eat good food in Paris on a budget, and it’s possible not to break the bank to enjoy the culinary delights of the capital. I always take visitors to Bouillon Chartier, one of Paris’ best kept secrets, for a trip back to Belle Epoque Paris and traditional French dishes. They have a daily changing menu depending on the season and I’ve never spent more than 20€ on a three-course meal there! My top tip would be to try the sorbets as they are simply divine! If French food isn’t your scene, head to the Marais for where Parisians go to dine out. The Marais is one of the oldest districts in the city and known for being the Gay & Jewish area. Every Parisian has their favorite establishment on Rue des Rosiers and friendships can be made or lost depending on your go-to restaurant, but if you’re asking me, you can’t go wrong with L’As du Fallafel. Order the sandwich falafel and savour the delicious flavours of the roasted aubergine, sumptuous tahini and fiery chili sauce that is already on your table. In the Marais, you’ll find some beautiful architecture, including this stunning hotel. If you’re looking for some off the beaten path Paris shots without the same Seine views, this is a great area for it! If you’re not too full, it is time to hit the dancefloor! As a student in Paris, I found that lots of the classic Parisian bars were prohibitively expensive and in search of a cheaper alcoholic beverage, my friends and I stumbled across Place Monge. A small quartier close to the prestigious universities the city has to offer, Place Monge is where the students come out to let their hair down, but don’t let that put you off. You can find quirky bars offering bizarre beers and even weirder interior decor. My personal favorite is Teddy’s on Rue Thouin. From the outside, it looks quite ordinary however when you enter it gets stranger and stranger. Stuffed bears are scattered with abundance, and the walls are covered with a furry leopard fabric. While the surroundings might be odd, the beers are excellent, and the delightful staff will help you to decide which is the right one for you. I like the Kasteel Rouge which is a tart, cherry beer that is deceptively strong! While you are nursing your sore head from the previous night’s escapades, you will surely need a good breakfast. Head up to Canal Saint Martin for the legendary pancakes at HolyBelly. I couldn’t tell you how many times I have recommended/frequented HolyBelly as I seriously can’t stop talking about the place. It’s one of the things I miss most about living in Paris! You can’t go wrong in here as everything on the menu is out of this world but be prepared to have to queue to get in. I’m not a morning person, and famously my friends know not to go near me before 11 am, but even I will haul myself out of bed for a trip to the best breakfast spot in Paris. After eating the best pancakes in Paris, head out to where all the kids like to hang out. 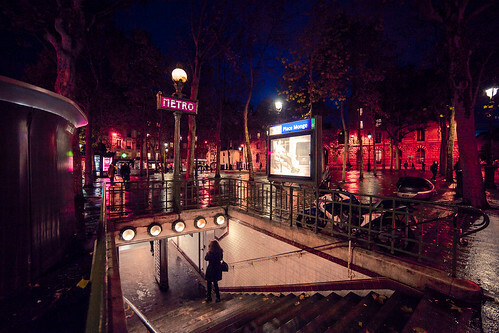 On numerous occasions, Canal Saint Martin has been named the hipster neighbourhood of Paris. It’s full of fascinating little boutiques and bars in and around the Canal, which is famous for appearing Amelie. (The scene where she goes to skim stones across the water.) It’s also filled with great breweries if you’re looking for some different things to do in Paris. Unmistakably, there are many more amazing places to visit in Paris but these are just some of my personal favorites, and I hope that this has inspired you to see beyond the clichéd view of the French capital. Paris has so much more to offer than views of the Eiffel Tower and romantic boat rides on the Seine. I hope that you enjoyed this off the beaten path Paris guide. So, what are you waiting for? Allez-y and book those tickets to Paris now! Have you been to Paris? What was your favorite non-touristy thing? Enjoyed this? You can follow Kate from MoreNativeThanTheNatives on facebook and instagram! If you found this guide helpful, please share it (pins at the bottom). I love these off the beaten path tips!